New vampire killing kit for sale! Another ORIGINAL by CRYSTOBAL, this small-sized (not miniature) kit is perfect for your Halloween party or curio cabinet. And the best part is, it’s only $49.95 – priced much lower than the artist’s full size Vampire Killing Kits for sale. This kit is small but packs a lot of cool stuff and a powerful punch against the dreaded Vampire. It has a striking appearance, and is lightweight for portability. The box measure 7″ long by 5″ wide by 6″ deep, and has been antiqued using CRYSTOBAL’s secret methods learned years ago by a woodworking master and developed over the decades to perfection. This kit surpasses all others of its kind in authenticity, originality, workmanship and artistry. CRYSTOBAL is the maker of the world’s finest vampire killing kits. This kit has been specially made for the Etsy market, and is being priced WELL BELOW market retail value. 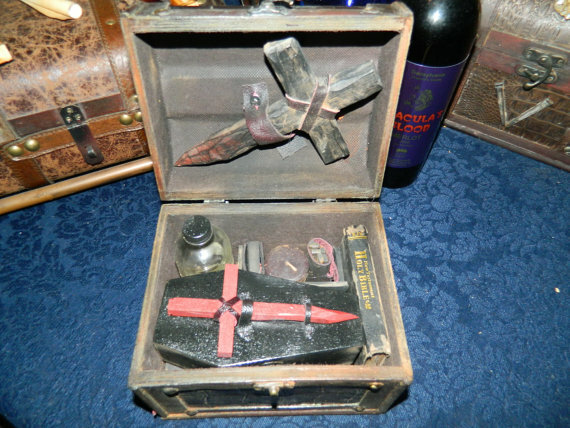 Don’t let the low price fool you: This vampire killing kit captures all the artistry and detail of his larger kits, costing hundreds or even thousands of dollars. Be the envy of your friends this Halloween with this incredible kit! Note: Although this kit is intended for decor or costume use, it is not intended to be over-handled. It is a work of art and should be treated accordingly. 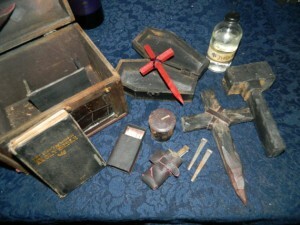 You can purchase this Vampire Killing Kit for Sale while it lasts, on etsy.